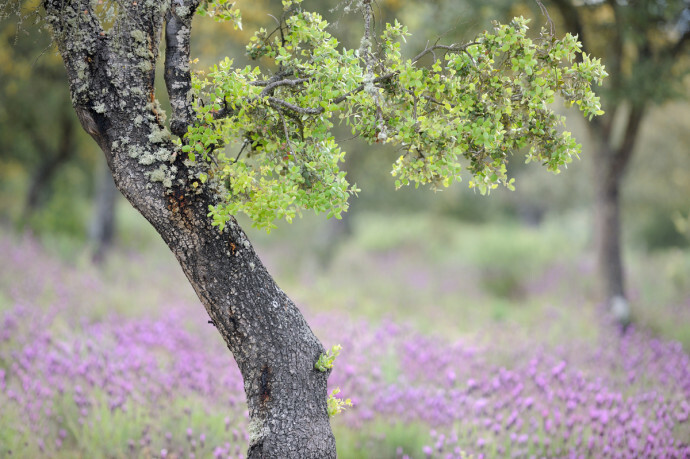 Early this spring we were the guests of the Faia Brava Reserve and of Campanários de Azaba Biological Reserve, Rewilding Europe’s two local partners in Western Iberia, right on the border between Spain and Portugal. Campanários de Azaba Biological Reserve, the two partners of Rewilding Europe in Western Iberia. Five fantastic days in the wilds. There is no need to make a reservation when you travel by train from Porto to Pocinho in Portugal. It seems like very few are travelling there. Over the last decades most people moved out from this area near the border with Spain. As the train followed the Douro River, more and more people got off, so when we arrived in Pocinho, it was not difficult for Bárbara Pais to recognize this Dutch family with its luggage. Bárbara is our guide on the first day in the Faia Brava Reserve. She explains why people left their properties around here. ”Since the 1960’s people abandoned this area, because they couldn’t make a living here anymore. For example: almonds from California were cheaper than those from Portugal. The villagers got other jobs and left for the cities.’’ As we drive through small villages, we only see elderly people in the streets. Most of them already long ago passed the age of sixty. Nevertheless there are newly built playgrounds for children, surprisingly. ”That’s because of the European subsidies,’’ Bárbara explains. Since the people left e farming and grazing lands, nature is now getting a second chance. Associação Transumância e Natureza (ATN) made FaiaBrava into the first private protected area in Portugal. The organisation buys land from farmers who quit farming or from families whose ancestors abandoned their fields already long ago. That is not an easy job; the Faia Brava area alone had over a hundred different land owners that ATN have had to negotiate with. 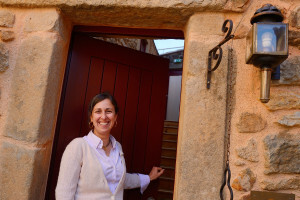 Ana Berliner, the owner and operator of Casa Cisterna Bed and Breakfast. April, when nature here maybe is at its best. On our first day here we went for a walk. We even encountered a herd of wild-living Garrano horses with their new foals. Castelo Rodrigo is a small historical village here, where we spent a great night at “Casa da Cisterna”. Ana Berliner, the owner of this Bed & Breakfast surprises us with a really delicious meal in her cosy house. As Ana is a biologist herself, she also has a big library with a lot of nature guides. Up here it gets a bit chilly outdoors during the night and we have a clear view of the stars. The following day we enter again the Faia Brava Reserve, now in a Land Rover Defender from ATN. It’s a bumpy trip along an old path with stone walls through the former farming fields. Villagers named it the Camino de Formigas (the ant road), because people always used to carry stuff along this road when they left the village at sunrise or came back from the fields at sunset. In the early morning the olive trees are crowded with birds and there is bird song all around us. João provides us with binoculars and points out many colourful birds like bee-eaters, hoopoes and crested larks. Through the binoculars we also check out a vulture’s nest and we see the horses again. Along the valley, there is a string of white, round houses in traditional style. These used to be pigeon houses, that the farmers here built long ago, because they used the pigeon’s droppings to fertilize the land. ATN is working to preserve and restore them, as a traditional part of the landscape. We notice lots of tracks from wild boar. They are numerous because there aren’t any large predators left in this area; the wolf was made extinct long ago. “But there’s hope for the future”, says João. “Wolves have been seen nearby recently, it is only a question of time until they are back.’’ When animals die in Faia Brava, the vultures take care of them. ATN also feeds the vultures with road kills and dead livestock animals, at a special feeding place where photographers and others who want to can watch the feeding vultures from inside a hide. ”In Portugal, we have two million hectares of abandoned land today’’, João tells us. ”We have decided to look at this also as an opportunity. We don’t have a detailed, specific end goal for nature in Faia Brava, it’s really rather the process of regeneration and rewilding. We would like a more natural number of trees and more of the original herbivore species and ATN is working on that’’. After seven hours of wandering and wondering in the reserve, the road back to town is just as bumpy as it was this morning. Quintã de Pêro Martins is the village where we spend the second night. Sara and Michael are the friendly hosts of this Bed & Breakfast, and they even lent us their dog Beckas for an evening walk around the village. This couple also knows al lot about the prehistoric rock engravings that have been found here in the Côa Valley. On our third day, we leave Portugal to go to Campanários de Azaba in Spain. Diego Benito Peñil is our guide for the following two days. Diego works for Fundación Naturaleza y Hombre, which also is the local partner of Rewilding Europe. He shows us an area called Riscos de Águeda and we immediately witness the striking difference with Portugal: this is a rolling area in stead of hilly and the fields are bigger and more open. Around here not the farming has dominated, but rather the livestock raising. “And the noble families in Spain used to own big territories,‘’ Diego completes. “But just as in Portugal, most of the young people moved to the cities, leaving an opportunity for nature”. Surprisingly, the Spanish broom is still flowering here which it wasn’t anymore in Portugal. So there are white flowers everywhere around us as we walk into the fields to a steep river canyon. We eat tortillas de patata, while listening to singing corn buntings. After lunch, we hit the road again. As we travel higher, the forest changes from mainly oaks to pine trees. Diego points out a small group of Iberian ibex on a steep hill. Close to the top of the mountain, there is a large monastery and even more ibex, a mother with a few youngsters. Swallows, swifts and vultures dot the sky. Diego then takes us to the Campanários de Azaba Reserve, where he lives with his family. After closing the fence, we immediately encounter a group of cows. That is special, because they have 500 hectares to wander around. His wife Ruth treats us to a great meal and an even greater view over the reserve. Around here it’s so quiet in the evening! Magnificent! Next morning we get up early and prepare for four hours in a hide, waiting to see the vultures up close. Diego brings us to the feeding place and puts out a bunch of dead chickens right in front of the hut. Now we only have to sit and watch, until the vultures will come to have their dinner. First come the ravens, the black kites and the red kites. They seem to check that there is no danger and they are closely watched by the vultures, who are soaring around a bit higher up in the sky. 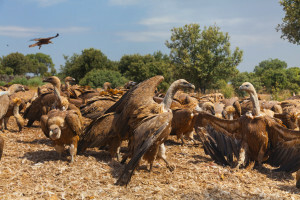 We thought we would maybe see only a few vultures, but to our surprise almost fifty vultures attack the dead chickens after almost two hours of waiting. Both black vultures griffon vultures. They make a lot of noise and leave us speechless in the hide. And yes, they are really big and almost frighteningly close, but in a way also really beautiful. As suddenly as they arrived, the vultures then quickly leave after finishing their lunch. When we leave our hide, we collect some huge vulture feathers in the killing field. The only thing left of the chickens are some white feathers. There are also some remains from previous vulture lunches on horses and sheep. It’s a bit weird walking in this vulture restaurant with bones lying around. You can smell death, but lavender as well. After having to sit still for such a long while, we felt we needed some exercise. Diego takes us for a three hour walk through the reserve. He shows us a fox den where we hide a camera trap, which will take pictures when the foxes leave their home during the night. We also pass a hide with a chimney, especially built to watch wild boar from (so that they can’t feel your smell). Walking through the reserve is a really fantastic experience. The landscape is a genuine mosaic. You see new kinds of trees and flowers every five minutes. And there are lots of lizards. 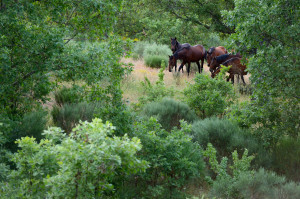 An ideal place also for the rare Retuertas horses, who live and roam here on their own. On our final day there, we make a last short walk and then we leave Campanários de Azaba for Portugal. We really enjoyed this trip in Western Iberia. It’s a beautiful wilderness experience and we hope to come back here soon again!